Miesha Tate and Amanda Nunes will battle it out for the women's bantamweight bout at UFC 200 in Las Vegas on Saturday night. Find below our betting preview on Tate v Nunes fight with expert tips, best odds, betting promotions and no deposit free bets on the UFC! 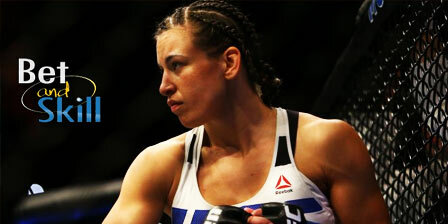 Miesha Tate is hittable and bit slow, but she has grit and heart for days. She knows to have here chance for a finish once Nunes slows down from the fourth round onward. She only need to weather Nunes’ early storm. Amanda Nunes (12-4) is on a three-fight winning streak, is 5-1 overall in the UFC with four finishes. She fought on that Rousey-Holm card and beat Valentina Shevchenko by unanimous decision, 29-28, 29-27, 29-27. Her best win was a first-round submission over former title contender Sara McMann, but outside of that, her wins have come against the likes of Shayna Baszler and Germaine de Randamie. Her only loss in the UFC came to former title challenger Cat Zingano in September 2014. "The Lioness" is an ultra-aggressive Brazilian striker with the ability to put anyone away in the first round. She has the striking power to potentially finish the fight, but there are question marks over her cardio and her approach can be somewhat predictable as the Brazilian tends to run out of gas pretty quickly. "Miesha Tate v Amanda Nunes predictions, betting tips, odds and free bets (UFC 200)"